Investigations first began into Lyme disease (LD) in the USA in 1975 after two concerned mothers, Polly Murray and Judith Mensch from Old Lyme in Connecticut contacted the health department about their sick children and what they felt was an abnormally high number of children with “juvenile rheumatoid arthritis” in their area. One of the scientists involved in the research of the cluster of patients in Connecticut, Willy Burgdorferi, identified the bacteria responsible for Lyme disease as a spirochete belonging to the Borrelia genre in 1981 (Two dates 1981/1982 seem to be used interchangeably in various literature: 1981 is the year the ‘discovery’ was made, whilst 1982 is the publishing date of the journal article in which the finding is described). As such this first species was named Borrelia burgdorferi, and being the first species identified, it is typically known as B. burgdorferi sensu stricto (in the strictest sense). Due to the original beginnings/investigation, LD was initially presumed to be a primarily arthritic condition, however it was soon found to have dermatological and neurological manifestations. In Europe, clinical aspects of LD have been written about in medical journals since the 1800’s. A skin condition which is now associated with chronic LD, acrodermatitis chronic atrophicans (ACA), was noted in patients of a German doctor, Alfred Buchwald in 1883, whilst the rash that some LD patients observe, known as erythema migrans (EM) was originally described in 1910 by a Swedish dermatologist, Arvid Afzelius as erythema chronicum migrans (ECM). In 1922, French physicians, Garin and Bujadoux, described neurological (Meningopolyneuritis) symptoms which occurred in a patient after an Ixodes hexagonus tick bite. B. miyamotoi (B. miyamotoi sensu lato) have been reported in a number of studies in the United States from 2001 (eg: 6-8) and Europe since 2002 (9). Genetic sequencing of B. miyamotoi has revealed that it is closely related to the B. lonestari species of Borrelia (1). B. lonestari is associated with a “Lyme-like” disease known as Southern Tick Associated Rash Illness (STARI), or Masters Disease, which is reportable to the Centre for Disease Control (CDC) as Lyme disease (10). Worldwide there has been over 20 Borrelia species identified as being associated to Lyme, or Lyme-like disease in humans. 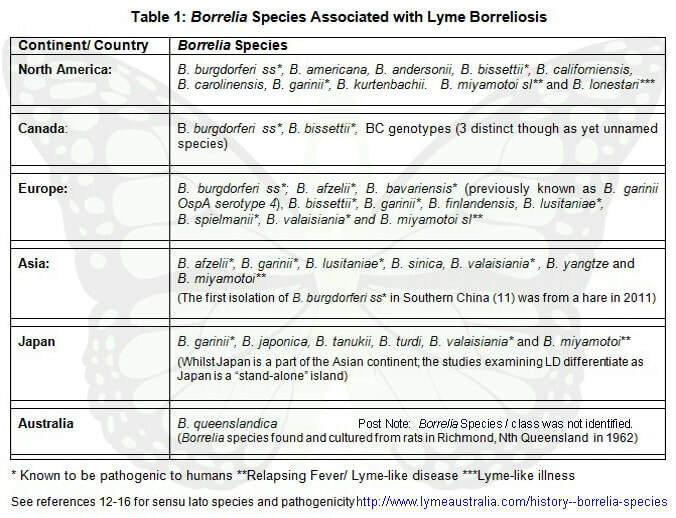 Please note: There are a number of other Borrelia species that have been identified since this table was compiled. the information from which many sections (Lyme Borreliosis and Lyme Transmission) of this website are derived from. The pathogenicity of bacteria (or any organism able to cause illness) refers to its ability to bring about disease in a host. Borrelia species vary in their ability to cause illness in different animal species, including humans. While all the species listed in Table One above have been isolated and identified from ticks and animals, and therefore can potentially cause disease, it is not until a species has been isolated from human tissue, that it is acknowledged as pathogenic to humans. The ability to understand the pathogenicity of each species and the development of adequate diagnostic/ testing procedures to ascertain human infection status is made that much more difficult by the fact that within the above mentioned species there are 100’s of strain variations (eg:17-24) involved. For example, until recently B. bavariensis was known as B. garinii OspA serotype 4. Sequence analysis and testing revealed that this strain (serotype 4) was specific to rodent hosts (and unable to survive bird serum), with the opposite being shown for B. garinii serotypes 3,5,6 and 7, which are bird associated strains, and unable to survive in rodent serum. Due to the sequence analysis and host differences, B. garinii OspA serotype 4 was therefore classified as a separate species, B. bavariensis (17). Another brief example is that vector differences, as well as sequence analysis, reveals that the B. garinii and B.valaisiania strains from Europe differ from the B. garinii and B. valaisiania-related strains from Asia (18,19). These above examples outline why it is “important to develop alternative identification tools which are able to distinguish Borrelia strains not only at the specific level but also at the intraspecific level” (25: Pg 509). Understanding that there is such an enormous number of strain diversities, even within species of Borrelia, allows for a better appreciation as to why Lyme disease is primarily a clinical diagnosis. When testing for Borrelia infection, it is imperative that there is an understanding that the accuracy of the tests are limited by various factors, one of which is the species diversity, and that for more accurate testing and diagnosis, “the choice of a B. burgdorferi sensu lato strain for an antigen in serological testing is important” (26: Pg 52). Unless specifically stated otherwise, the term Borrelia (ie: Borrelia was found in a certain host) on this website is used in reference to Borrelia spirochetes responsible for Lyme disease/ Borreliosis in humans. B. recurrentis, is transmitted by the human body louse, and is the only species of Borrelia acknowledged as being transmitted via an insect rather than a tick. Borrelia species such as B. garinii and B. valaisiania responsible for Lyme disease in humans are also carried in birds. As well as being able to cause disease in humans, both the B. burgdorferi ss and B. garinii species have also been found associated with Borreliosis in cattle. Borrelia responsible for the above diseases are differentiated from the Borrelia species that are responsible for Lyme disease/ Borreliosis in humans by genetic and vector (different tick species) differences. Although it should be noted that differentiating via tick species that transmit the disease is starting to become more ambiguous with species such as B. miyamotoi, in which the vectors differ from the typical pattern. Typically, spirochetes responsible for Lyme disease are transmitted via hard ticks, whist relapsing fever is transmitted via soft ticks, however with the Miyamotoi species, both hard and soft ticks have been found capable of transmitting the disease, and also unlike other Borrelia species responsible for Lyme disease, the bacteria is passed from the female tick to the egg/larvae (eg: 1, 5, 6). The pathogenicity status was taken from reference 4 and 5 above. B. lusitaniae is noted as being found to be pathogenic by Scott et al 2010, though Stanek and Reiter (2011) write that : “The clinical role of B. lusitaniae remains to be substantiated” References 14 and 15 refer to human isolations of B lusitaniae.